In May 2013, more than 480 researchers and 80 scientific organisations published a declaration condemning the use of the journal impact factor to measure scholarly success. Journals and organisations such as Science, Proceedings of The National Academy Of Sciences (PNAS), Times Higher Education, and Wellcome Trust are among the organisations backing this call. the need to capitalise on the opportunities provided by online publication (such as relaxing unnecessary limits on the number of words, figures, and references in articles, and exploring new indicators of significance and impact)”. The declaration concludes that we need a cultural change where papers are mainly evaluated for their own scientific merit. A note in Nature (2005) stated that research assessment “rests too heavily on the inflated status of the impact factor”. And the biologist Stephen Curry of Imperial College London wrote in a blog post: “I am sick of impact factors and so is science”. Erlend Hem’s Editorial in the Norwegian Medical Journal “Too many journals – too little good research” is thought-provoking, especially the question of whether we publish too much. Fewer and better publications is a good conclusion of his Editorial. But, if we should publish good articles in traditional journals or in electronic “Open Access” (OA) journals is difficult to answer. OA has improved access to medical journals. Researchers in developing countries can access them free. Hem suggests that traditional journals have better peer-review than OA journals such as BioMedCentral. I know of examples of articles that have inadequate peer review. However, this applies to both OA and traditional publications. In the research training programme at the University of Bergen, students criticize scientific papers, often from well-known journals such as BMJ and Lancet. And, they often find serious mistakes in the papers. My question is: Is the editor best suited to choose what is good and important science, and what is essential to publish? And, we know that editors favour scientists they learn to know at conferences and meetings. Many electronic journals (such as PLoS ONE and BioMedCentral) accepts all submitted articles as long as they meet minimum scientific criteria. Such a policy means that they publish many scientific articles. And such journals have a surprisingly high impact factor, and the best research institutions use them. Is not it time the Norwegian medical Journal (and other journals) are more “Open Access”? I suggest that all articles that meet the minimum scientific requirements should be published electronically. The Editor can then choose articles they wish to publish in the printed paper version. 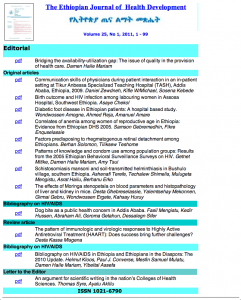 The latest issue of Ethiopian Journal of Health Development is now avaiable here. The 2010 edition of Thomson Reuter’s Journal Citation Reports has been released. Two open access journals rank as number 1 and number 2 in the Tropical Medicine category. 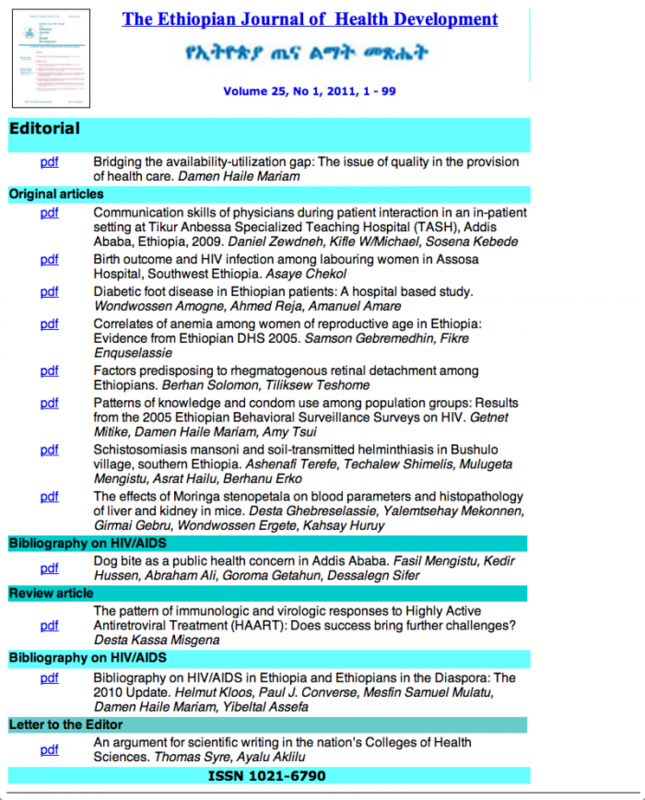 Global Health Action (GHA) is an international, peer-reviewed Open Access journal, which was launched in 2008. It is affiliated with the Umeå Centre for Global Health Research (CGH) in Sweden. The Journal is registered in PubMed, and reaches a global audience in 190 countries. The journal has recently started a new area of editorial content called PhD Reviews. They invite young researchers that have recently defended their PhDs within the field of global health to write a paper based on their cover stories. One background reason for this is that Scandinavian PhDs are usually based on a set of articles synthesized into a “cover story” of some 30-50 pages. Some of these syntheses provide excellent reviews of the research area but they seldom reach beyond the host institution or the close collaborators and examiners. Condensing them into a PhD Review may also serve as incentive for the young researcher to publish their first post doc paper as a sole author. You may find a few examples at their website, www.globalhealthaction.net, or by clicking here to find the section ‘PhD Reviews. Should science bloggers play a role in discussing peer-reviewed publications? That is the question an interesting Editorial in Nature raise on December 16, 2010. The background for was a paper about the discovery a bacterium can replace the phosphorus in its DNA with arsenic paper (F. Wolfe-Simon et al. Science doi:10.1126/science.1197258; 2010). The researchers had widely publicised their findings on the web, but when bloggers and researchers raised thoughtful reservations about the paper’s method and findings, the authors refused to comment because the blog was not peer-reviewed. Unfortunately, few papers get substantive comments. Nature states that bloggers have an important part to play in assessing research findings, especially when the criticism is from the researchers’ peers (a person of the same age, status, or ability as another named person). It is encouraging that journals now encourage post-publication discussion on blogs and online commenting facilities. This is a complement to, and not a substitute for conventional peer review. However, it is equally true that online commenting and blogs contribute little and few authors bother to respond to online criticisms of their papers (P. C. Gøtzsche et al. Br. Med. J. 341, c3926; 2010). pdf Assessing communication on sexual and reproductive health issues among high school students with their parents, Bullen Woreda, Benishangul Gumuz Region, North West Ethiopia. Desalegn Gebre Yesus, and Mesganaw Fantahun. Although I do some writing, I often find it difficult to write good papers. English is not my native language, and at school, grammar was not my favourite subject. But, everyone can benefit from improved writing skills at work, at home, online, you name it. I often use Strunk and White’s “Elements of Style.” But now another book is my favourite: “The Glamour of Grammar,” by Roy Peter Clark, which a book review in The New York Times says “is very much a manual for the 21st century”. I recently read this fascinating book. To be honest, this is the only grammar book I have read from beginning to end, and I will use it to improve my language. I learned that for the good writer, no decision is too small, including whether to use “a” or “the”. The book is not only about grammar: it is about improving writing. Each chapter ends with “keepsakes” (reminders), where the author summarises important points and keeps things informal enough and thus avoids sounding like a textbook. About 10 years ago, some scientists started an ‘open access’ campaign for free journals funded by author fees. A reason to start the open access journals was to make scientific publications available for researchers in developing countries. Can we after 10 years say that researchers in the poorer countries have benefited from this exercise? The two most important publishers are Public Library of Science (with six journals) and BioMedCentral (with 206 journals). By various measures about 10% of all biomedical journals are now open access. PLoSONE expects to publish about 7500 papers this year, making it the world’s largest journal in terms of volume. A review in 2009 shows an 8% citation advantage for open-access articles, although the rate was higher in developing countries (Evand and Reimer, 2009).From personal experience I have learned that Ethiopian researchers try to publish in open access journals. This is a natural development because they are exempted from paying the processing fees. Another benefit for researchers in developing countries is that many of the open access journals have a good citation index, showing that research papers are widely read and cited. However, there is also a weakness in the open access publishing for developing countries. Unfortunately, the scientific literature the researchers read and cite is often limited to articles found in open access journals. This may result in a selective reading of researchers and students. So researchers in the poor countries need to have better access to read journals. Unfortunately, initiatives as HINARI are often limited to a few individuals and to libraries.